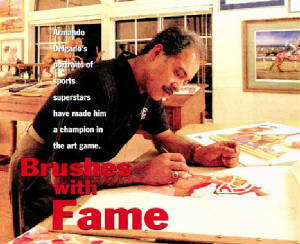 Delgado has always had a passion of capturing the "Sport of Kings " since he was 17. 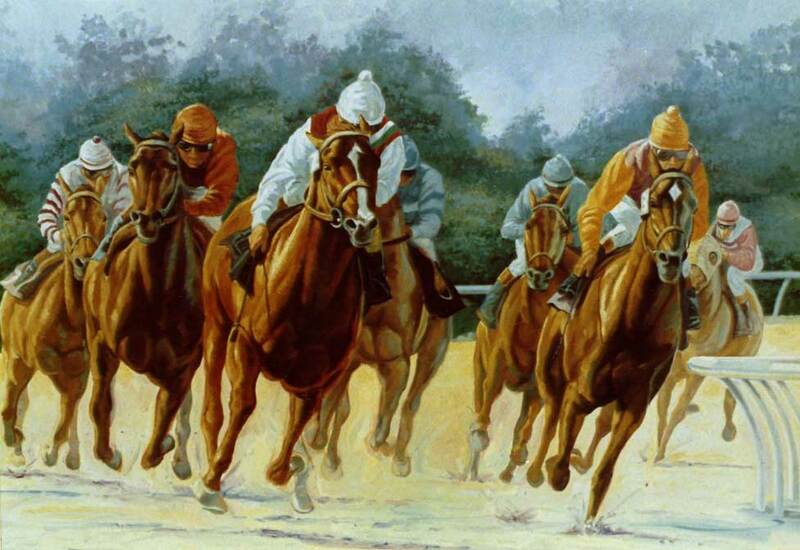 "Prior to seeing my first race I loved painting horses mostly in Western scenes with cowboys and Indians. At 17 I was introduced to my first race. Witnessing the excitement of the sport, the flashing of the silks and the combine talents of beast and man working together, I was hooked! At this moment I knew that I would use my talents fueled with this passion in capturing this sport on canvas. 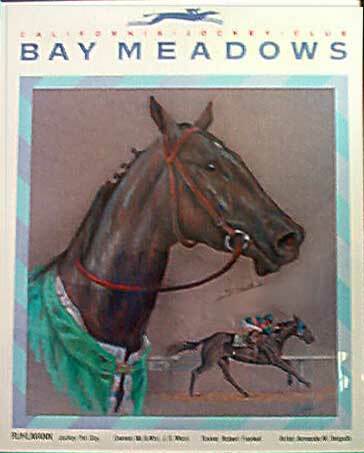 Shortly afterwards I started getting commissions to created originals for race horse owners, race tracks and promotional pieces, which led to creating works for the Breeder's Cup. Racing will always have a special part of my heart." Delgado. $199.00 shipping is included, within the continental U.S., Comes with a autograhed copy of magazine whilch features the same art by Delgado, while supplies last. 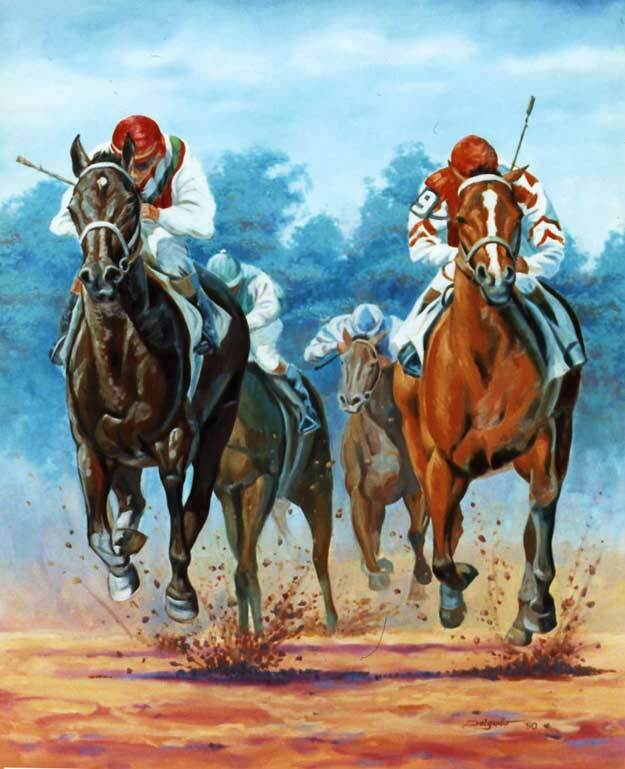 a LIMITED EDITION offering of a full color reproductions of the art that was selected to be the cover of "THROUGHBRED STYLE".Each print measures 20"x14" and comes autographed by the artist. Each order comes with an autographed copy of the magazine, while supplies last. $449.00 Professionally Framed Print. Includes autographed print,wood molding, double acid free matting and glass, comes ready for displaying! Shipping included within continental U.S. SORRY SOLD OUT! Secretariat and Cy Young winner, Giants pitcher, Tim Lincecum. 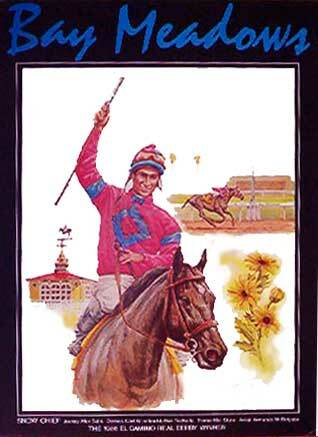 When asked by a reporter what was Tim's favorite nickname he promptly said SEABISCUIT. This was the name his college coach gave him and caught on because his throw reminds him of the legendary stretch of Seabiscuit. Here the artist brought the two Bay Area champs together. 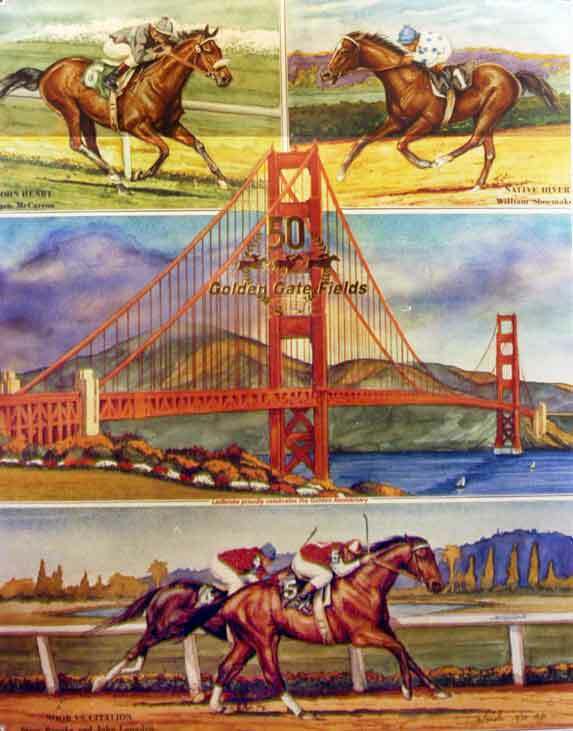 We have produced only 55 lithographs of this piece specifly for an event held at AT&T park. Each measures 11"x17". Each is signed and number by the artist and AUTOGRAPHED bt TIM LINCEUM! A VERY SMALL AND RARE EDITION! 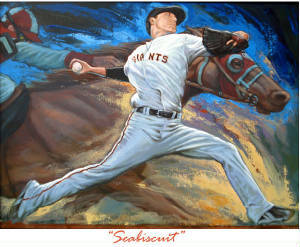 $349.00 SECRETARIATS-LINCECUM -SORRY SOLD OUT 11"X17" Lithograph signed and numbered by the artist. and autographed individually by Cy Young winner-TIM LINCECUM. ONLY 55 PRODUCED! Shipping included within continental U.S.
$399.00 Professionally framed-Includes print,handsome wood molding,double mats, glass, comes tready to display! 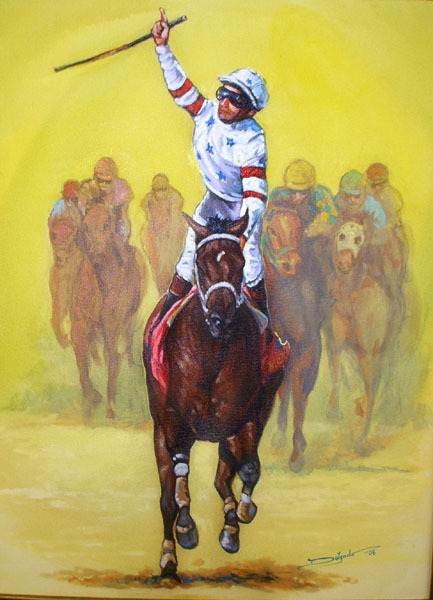 Shipping is included within the continental U.S.
Full color reproductions of this wonderful portrayal of this legendary champion. Portrayed here is his full stretch as he reaches the finish line. $249.00 Full color reproduct Ltd. Edition print. Sign and numbered by the artist. 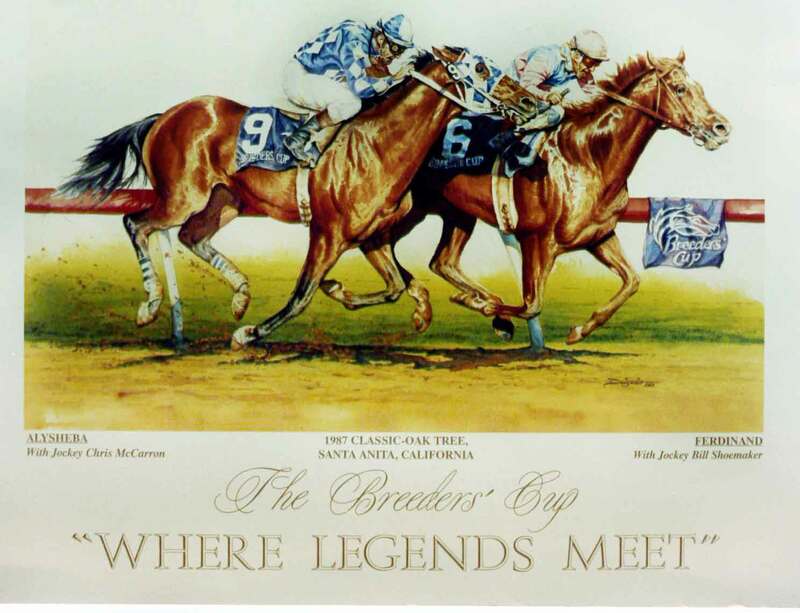 Shipping included in the continental U.S.
Around the stretch and Seabisquit leads! HAND PAINTING BY THE ARTIST! Measures 22" x 28 on stretch canvas. Giclee canvas reproductions are available on a limited basis, only 25 will be produced! These are reproduced on canvas on stretcher bars with actual hand painted enhancements by the artist! shipping included. Please allow up to 3 weeks for delivery. $289.00- Professionally framing is offered which includes an elegant wooden frame and comes ready to display. Includes enhance giclee and shipping. a new commissioned work by Delgado! Limited edition lithographs and giclees,reproductions on canvas, have just been made available! Limited Edition lithographs are NOW available. These are printed on premium stock and are signed and numbered by the artist. Professionally framed lithographs are available which includes double matting, wooden frame, glass and is ready to display for $210.00, Includes lithograph and shipping for $209.00. These two perhap produced someof the sports most exciting moments in racing history. 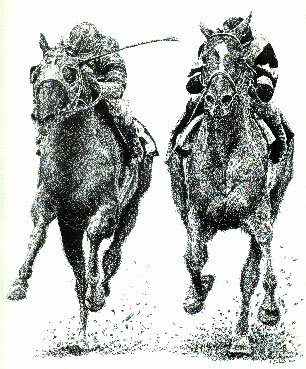 Each of the triple crown races involve these two racing neck to neck at the finish! Limited Editon of only 200 produced. $50 Snow Chief- lithograph by Delgado- Limited edition, signed by artist. Shipping is included. $299.00 plus $8 for shipping. Big Brown-Canvas reproduction with hand painted enhancement. Please allow up to 3 week from time of order to delivery since each is individually produce. 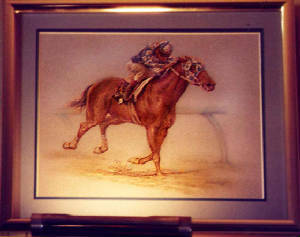 are available of this fine work showing his celebration crossing the finish line. The lithographs are 11" x 17", which fits a standard frame. Custom giclees, 22" x 28" reproductions on canvas which features hand painted enhancement are also offered. Big Brown- $99 plus an additional $6 dollars for shipping. Each comes signed by the artist and a certificate of authenticity is included. 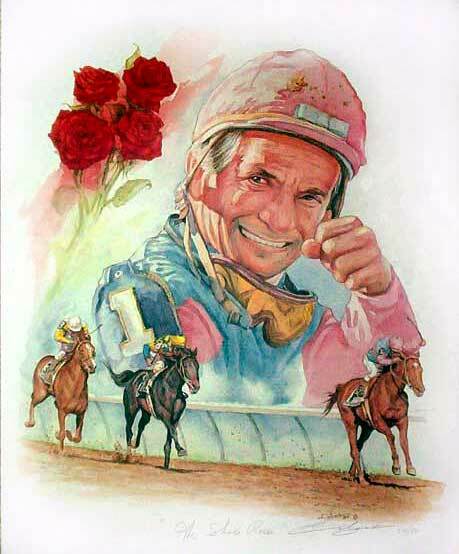 $150.00 Bill Shoemaker Artist Proof shipping included. Only available at this site. 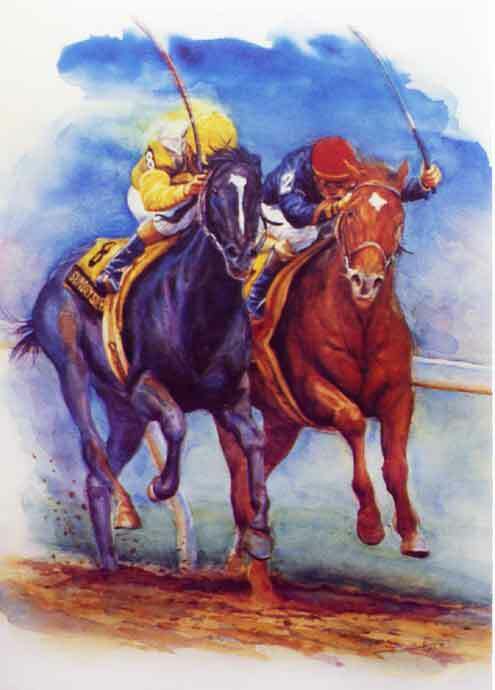 $100.00 Featuring Alyseba vs. Ferdinand 1992 Breeders' Cup Reproduction by Delgado, autographed by the artist. shipping is included. 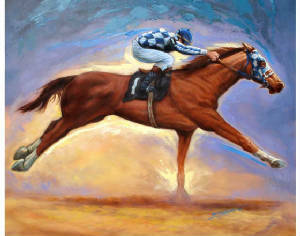 Secretariat, one of racing's historical champions. 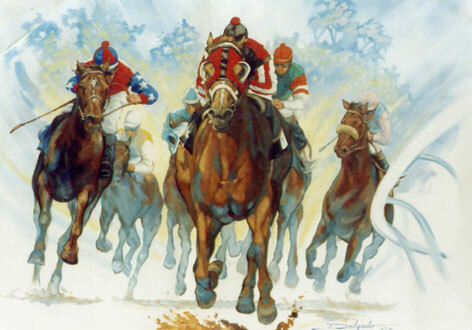 The great "RED" is shown here winning the Belmont, the last leg of the Triple Crown. This original work was commissioned by a private collector. This was created in pastel by the artist. One of racings all time favorites. Known to carry given extremes adding weight yet still prevailing over all others. Loved the slop! 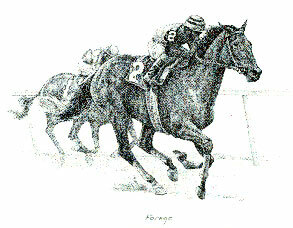 $100.00 Forego limited edition lithograph, signed by artist. Shipping included. 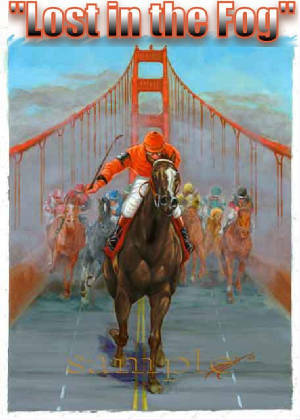 $500.00 for an original giclee of "Down the Stretch". 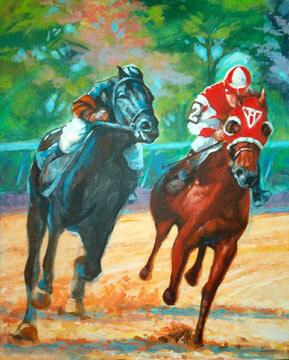 $650.00 for a FRAMED original giclee of "Down the Stretch". 24" x 36". Professional Framing is available for an additional 150.00. Shipping is included. $50.00 Full Color reproductin signed by artist. Shipping is included. 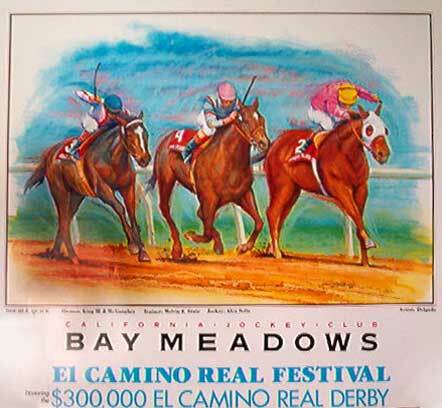 Another edition of a limited series created by Delgado to specificly honor the winner of the "EL Camino Real Derby", a class 2 race held at Bay Meadows, San Mateo, CA. $50.00 Double Quick-El Camino winner by Delgado. Signed by artist and shipping is included. 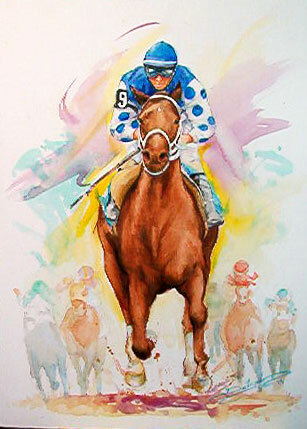 Smarty Jones, here he comes! This one of a kind work measures 18" x 24" and was created in watercolor, it is also beautifully framed and comes ready to hang. The value of this one of a kind collector's gem has been estimated at $5,000.00. Inquiries of it's availability can be directed through email. 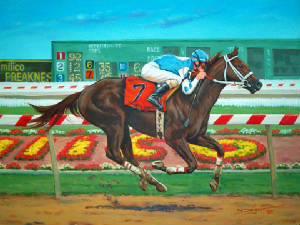 Winner of this Years 2004 entucky Derby and Preakness and just shy of winning the Triple Crown. 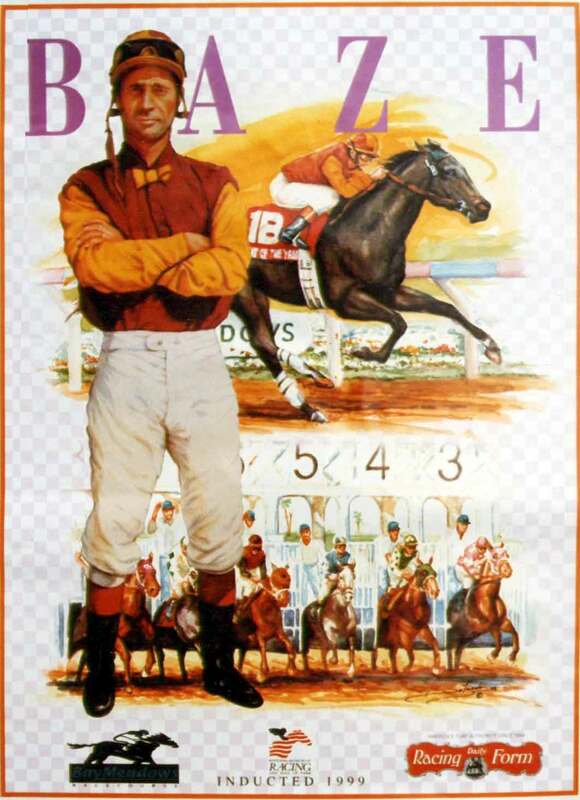 This champion stole the hearts of many a fan with his spectacular streak of 9 straight races won! One of the nation's greatest sprinters. ECLIPES Winner of 2005! Beloved by fans throughout the racing world! Very few of the Limited Edition Lithographs -Giclees are left available. Commemorative tee shirts(sorry, sold out). RULHLMAN, with Pat Day, wins! 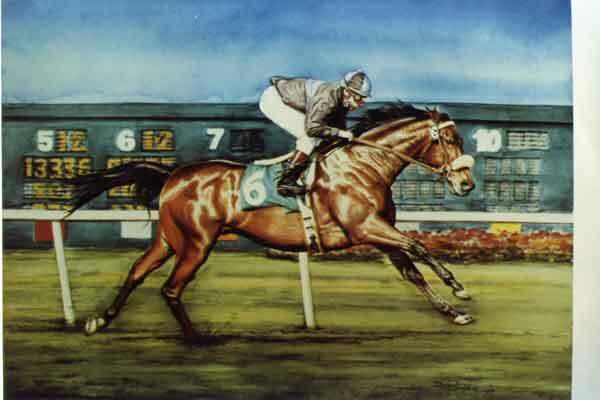 This winner was trained by the legendary Robert Frankel, and ridden by the outstanding jockey, Pat Day. $50.00 full color reproduction signed by artist. Shipping is included. Around the turn they come!